Wrap Up – 2017 | Turn Up! 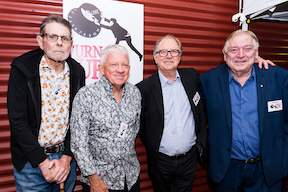 Four legends of the music industry turned out to the 2017 Turn Up Sunshine Coast Music Industry Conference last Thursday 19 October, to a packed ‘The Lind’ Theatre at Nambour. Ted Gardner, Barry Bull, Glenn Wheatley and Bill Hauritz, headlined a diverse line up of panel speakers, delegates and guests for an evening of inspiration, celebration, education, and connectedness, to encourage the next generation of the Music Industry practitioners. The Turn Up program included keynote presentations, conversational discussion panels with leading music industry achievers and showcase performances from local Sunshine Coast artists Nicole McKinney, Mason Hope and Doolie. Keynote speaker Glenn Wheatley distilled his 50-year music industry career into five tips for how to turn up YOUR volume in the new music business. Insights, combined with stories about managing John Farnham, Delta Goodram, Little River Band as well as managing and playing in The Masters Apprentices, Glenn stressed the importance of writing or finding the right song. “Find your own groove, believe in yourself, be savvy with technology, find a mentor, be resilient, never give up and remember, success is achieved when ambition and talent are in sync”, he advised. When launching the conference, Division 10 Sunshine Coast Councillor Greg Rogerson acknowledged the financial wealth the music industry contributes to our region and announced council’s commitment to the establishment of a dedicated entertainment precinct for Nambour within the next 12 months. In conversation with Eloise Gallagher, Bill Hauritz advised acts applying for bookings at festivals, to remind themselves they are asking to “become a part of a festival community. Focus on what you can give the festival as a musician, and let your music speak for itself”, he said. Panel topics included The importance of brand building and image making and How music can shape the culture of a city. The Turn Up crew will be back next year with another great line-up of speakers and panels for the Turn Up Sunshine Coast Music Industry Conference in October 2018. Speakers and Presenters: Barry Bull, Sunshine Coast Councillor Greg Rogerson, Glenn Wheatley, Cindy Vogels (Racy and Lucky), Stephen Booth (Stephen Booth Photography), Jed Cahill (In The Bin Film Festival and Queensland Touring Film Festival), Seth Clancy (Oztix), Kylie Cobb (Kitty Kitty Bang Bang), Kellie Lloyd (APRA AMCOS), Ted Gardner, Bill Hauritz (The Woodford Folk Festival), Eloise Gallagher, Andrew Stafford (Pig City), Rhoda Roberts (Head of First Nations Programming, Sydney Opera House and Festival Director, Boomerang Festival), Ragnhild Ohren Nordset (JMC academy and LIPA), Dimitris Limnatitis (The Solbar and Ocean Street) and Phil Smith (Sunshine Coast Creative Alliance). Supporting businesses and sponsors: Oztix, APRA AMCOS, Sunshine Coast Creative Alliance, Scenestr, Shake It Up Music, Sunshine Coast Council, 91.9 Sea FM, 92.7 Mix FM, 91.1 Hot FM, 96.1 Zink FM, Hotel Beach House Nambour, The Basement, Prysim, Q Music, Band Print, Miss Music Biz and Hostile Entertainment. “I found this industry event to be a great opportunity for networking with many Sunshine Coast musicians, agents and music industry specialists also with industry guests who had national and international status . I gained great insight form all the panels that discussed everything from branding, image and social media , to music distribution and I especially enjoyed the speaker from Apra who made everything very clear to understand. The keynote speakers such as Glen Wheatley gave some great indications of what it takes to be part of the music industry.